Gaming laptops are now being offered on a lowered prices, along with WiFi routers, TVs, monitors and more. Today’s deals roundup includes the best deals from some of the largest e-commerce websites. 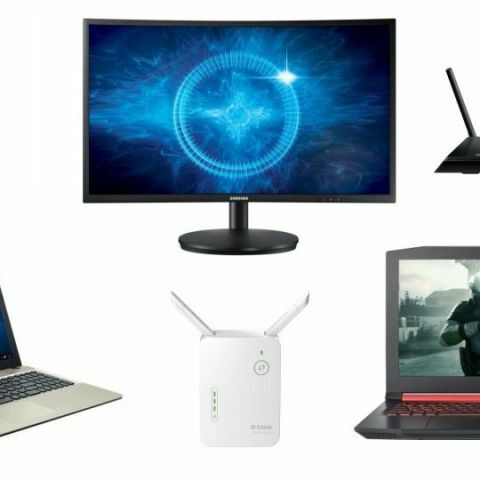 There are discounts on laptops for gaming and for general everyday use, along with price cuts on monitors, TVs, routers and some other gizmos. The Asus laptop is powered by a 7th Gen Core i3 and 4GB DDR4 RAM. It comes with a 1TB HDD and features a 15.6-inch Full HD LED Backlit Display with a 1366 x 768p resolution. You can buy the device here. The Panasonic TV features a 40-inch full HD LED panel and is a smart TV. It sports two HDMI, two USB ports, Bluetooth and WiFi for connectivity. The TV is equipped with two 5W speakers and you can check it out here. The 24-inch Samsung monitor features a Full HD Display and has a 1ms response time. It comes with two HDMI and one display port, along with a 3 years onsite warranty. You can buy it here. The Acer Nitro 5 is powered by a 7th Gen Intel Core i5 processor with 8GB DDR4 RAM and 1TB HDD, and features the Nvidia Geforce GTX 1050 GPU. It comes with 128GB SSD as well and sports a 15.6-inch display. You can buy it here. The Netgear wifi router supports 450 and 1300 Mbps speeds and comes with high powered external antennas. The company says that its ideal for connecting 12 or more devices and it comes with one USB 3.0 and one USB 2.0 port. You can buy the router here. The Honor 7X features a 5.93 inch full HD+ display with an 18:9 display aspect ratio and is powered by a Kirin 659 SoC with 4GB RAM and 32GB internal storage. It comes with a 16MP + 2MP rear camera setup and an 8MP front facing camera. There is an additional Rs 1,000 off on exchange with the smartphone and you can buy it here. The D-Link Wireless Range Extender boasts of up to 300Mbps data transfer speeds and supports the standard 802.11 b/g/n standards. It comes with a smart signal indicator, which helps one in figuring out where the best coverage is and needs to be installed into a wall socket to work. You can buy the device here.